by Mr. Peter MacDonald, Sr. There are several important, ongoing DoD initiatives aimed at accelerating acquisition so that capability can be delivered to the warfighter faster. The goal of the Rapid Innovation Fund (RIF) is to “facilitate the rapid insertion of innovative technologies into military systems or programs that meet critical national security needs.” Such needs are all encompassing. The RIF Broad Agency Announcement for FY 2018 contains 135 pages of topics and associated requirements. To what extent will obsolescence during production and initial fielding be reduced because of fresher designs? Will there be a corresponding increase in obsolescence later in the life cycle? Will multiple system configurations complicate DMSMS monitoring? In what ways? Will technical data (TD) access be affected? Will TD requirements be traded off to increase speed? Will TD needs and associated costs be increased because of multiple configurations? To what extent will there be a proliferation of new parts into the DoD supply systems to meet performance targets? What does this mean for parts standardization? Will part selection tradeoffs be made favoring performance over reliability as a result of the rapid insertion of leading edge technology? How will counterfeit part trends be affected? Will those trends mirror the prevalence of DMSMS issues? Will malicious insertion opportunities increase given the extent to which new technologies being inserted are heavily software dependent? Over the four days of the Conference, attendees will hear these questions and others discussed in detail. Attendees will also have an unprecedented opportunity to interact with leading experts on these subjects in informative training, dynamic plenary talks, and leading edge technical breakout sessions. 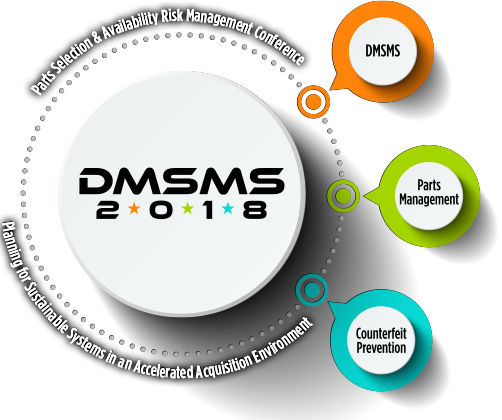 You are invited to attend the Diminishing Manufacturing Sources and Material Shortages (DMSMS) 2018 Conference scheduled for December 3-6, 2018 in Nashville, Tennessee. You may also attend the concurrent Defense Manufacturing Conference at no additional expense (by qualifying as active US Military, Government or current DD2354 on file), giving you access to more technical information for the same travel cost. The expanded Exhibit Hall will include all the leading organizations from both the DMC and DMSMS communities. Agenda, registration, and lodging information will be posted on this website. You can also view links from past conferences, access proceedings and see information about prior individuals and teams honored for their management of DMSMS programs. We are looking forward to seeing you in Nashville! Choose a package or customize your own!